In the Marina Board meeting yesterday, the Marina administration recommended to the board the lifting of the suspensions of 3 SuperFerry vessels and 2 CebuFerry vessels. The Marina Board gave the Marina administration, authority to lift the suspension on a per vessel basis as long as Marina is satisfied with the inspection results. Our other RoPax vessels are undergoing Marina inspection. We are confident that all of Marina's requirements will be fully complied with by all SuperFerry vessels by the end of this week. As of September 17, 3:30pm 964 crew members and passengers have been accounted for, of which 10 are fatalities. 7 passengers are still unaccounted for. We have repatriated a total of 823 passengers and 123 crew members to their respective destinations, while 3 remain in hotels, whose forward transfers are currently being arranged. And 1 passenger is still confined in the hospital. SuperFerry will continue to care for the injured, repatriate the survivors to their respective destinations. Get the best travel deals from SuperFerry year-round! As of 6pm, 961 crew members and passengers have been accounted for. Regretfully, there are 10 fatalities. 10 names in the official manifest cannot be physically matched but we also have 10 persons rescued and physically accounted for, whose names are not in the manifest. SuperFerry1 with 56 rescued passengers bound for Manila arrived today, September 9 at 2pm. SuperFerry has already repatriated 760 rescued passengers and crew from rescue sites and Zamboanga city to their respective desired destinations. There are 62 rescued passengers who are scheduled to be repatriated today. 106 passengers are scheduled to be repatriated starting tomorrow. 23 rescued passengers are still being treated in various hospitals. The insurance coverages of the passengers and vessel are mandated by law. SuperFerry is a responsible corporate citizen and adheres strictly to all governing laws. SuperFerry has offered each rescued passenger 6,000php for lost baggage compensation as indicated in the passage ticket. SuperFerry will also give 5,000php as additional assistance. This is aside from all the other assistance we have extended to our passengers such as transport to their final destination. We will continue to support and provide for the comfort of all our passengers until they are safely delivered to their destinations and are committed to assist the relatives and loved ones of those who perished in this event. MARINA has issued a statement clarifying that the 50,000php cash assistance is not applicable to SuperFerry9 passengers. It will only be given to survivors of incidents involving overloading of vessels. Contrary to reports of overloading, the SuperFerry9 sailed well within her passenger and crew as well as cargo capacity. SuperFerry consistently adheres to the standard safety requirements of Marina, ISPS and Philippine Coast Guard. ATS has filed a motion for reconsideration (MR) with Marina and a supplemental order was received yesterday allowing SF 1, 12 and 19 to complete their voyages and return to Manila. The Marina Maritime Safety Office will conduct an audit of all compliance documents. If the vessels pass this audit, a re-inspection and re-audit will be scheduled without affecting the sailing schedule. If the vessels fail the document audit, that vessels will immediately be subjected to a technical inspection and onboard audit and will not be allowed to sail until all the deficiencies are corrected. To prevent further inconvenience to our passengers, we have refunded our passenger their tickets and will advise them accordingly once our schedules have normalized. Pls. visit http://www.superferry.com.ph for the updated list. As of 7pm, ATS officially received the Marina order only today, September 8 at 8:05am. We have filed a motion for reconsideration (MR) with Marina and a supplemental order was received at 5:30pm allowing SF 1, 12 and 19 to complete their voyages and return to Manila. Upon arrival of the said vessels in Manila, Marina Maritime Safety Office will conduct an audit of all compliance documents. If the vessels pass this audit, a reinspection and re-audit will be scheduled without affecting the sailing schedule. If a vessel fails the document audit, that vessel will immediately be subjected to a technical inspection and onboard audit and will not be allowed to sail until all the deficiencies are corrected. Our vessels will continue to trade until they are ordered to stop because they failed their respective safety inspections. All 960 crew members and passengers have been accounted for. Regretfully, there were 9 fatalities. 11 names in the official manifest cannot be physically matched but we also have 11 persons rescued and physically accounted for, whose names are not in the manifest. SuperFerry1 with 56 rescued passengers bound for Manila is estimated to arrive tomorrow, September 9 at 2pm. The insurance of the passengers and vessel are mandated by law. SuperFerry is a responsible corporate citizen and adheres strictly to all governing laws. We will continue to support and provide for the comfort of all our passengers until they are safely delivered to their destinations and are committed to assist the relatives and loved ones of those who perished in this event. As of 8:30pm, all 955 crew members and passengers have been accounted for. Regretfully, there were 9 fatalities. 16 names in the official manifest cannot be physically matched but we also have 16 persons rescued and physically accounted for, whose names are not in the manifest. SuperFerry1 departed from Zamboanga last night, September 6, 11:15pm. It is estimated to arrive in Iloilo tomorrow, September 8, 5:30am with 119 rescued passengers, 63 rescued passengers bound for Manila are estimated to arrive tomorrow, September 8 at 12midnight. SuperFerry5 arrived in Bacolod from Zamboanga at 7:00am with 58 rescued passengers who disembarked in Bacolod. SuperFerry5 departed from Bacolod at 11am and is estimated to arrive in Manila tomorrow, 8:30am with 122 rescued passengers. All other rescued passengers are in Zamboanga. SuperFerry has arranged for all required assistance such as medical, hotel accommodations, clothing, food and transport needs for the rescued passengers and crew. All injured passengers have been brought to the hospitals for treatment. Relatives of the passengers may get assistance from centers that have been set up in Manila, Iloilo, General Santos, Davao and Zamboanga. Funeral arrangements will be made for those who perished in this event. The insurance of the passengers and vessel are mandated by law. SuperFerry is a responsible corporate citizen and adheres strictly to all governing laws. We will continue to support and provide for the comfort of all our passengers until they are safely delivered to their destinations and are committed to assist the relatives and loved ones of those who perished in this event. SuperFerry has consulted oil experts from Shell Philippines who assured them that the fuel oil onboard, which is of the heavy type of fuel, will most probably stay inside the fuel tanks of SuperFerry9. There is approximately 220 tons of this fuel onboard. A small oil slick of the diesel fuel type was spotted from the air. SuperFerry hired contractors with oil booms to handle this small slick with chemical oil dispersants. Philippine coast guard has also mobilized their Buoy Tender from Palawan with another oil boom and oil dispersants onboard. Some container vans have floated and are now in the process of being recovered by tugboats to be towed away from the navigational lanes. Contrary to reports of overloading, the SuperFerry9 passenger and crew capacity is 1,120. We only carried a total of 971 crew and passengers. Our cargo capacity is 209 TEUs and we only loaded 186 TEUs. We are well within the capacity of our vessel. SuperFerry consistently adheres to the standard safety requirements of Marina, ISPS and Philippine Coast Guard. The ship was cleared to sail by General Santos Station of the Philippine Coast Guard. There was no explosion, smoke or fire. The hull of the Superferry 9 was intact, there was no water ingress. Please visit our website, www.superferry.com.ph for the list of passengers accounted for. 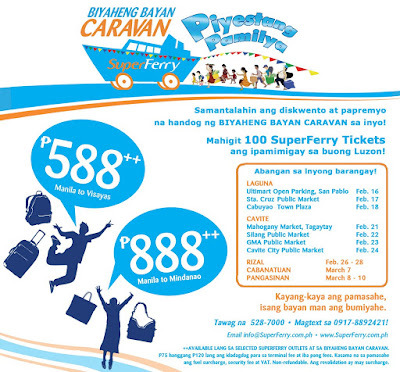 You may also call our SuperFerry hotline, 528-7000 for inquiries. 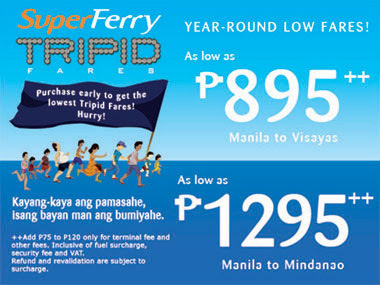 SuperFerry makes travelling affordable and flexible to all Filipinos as it brings back the SuperFerry Todo Tawad Sale! A trip from Manila to Visayas or Mindanao and vice-versa in all accomodation only sells for P500++. Buy now to enjoy bigger savings! Fares are inclusive of fuel surcharge, security fee and VAT. "After all charges are paid, SuperFerry fares remain substantially lower than other alternatives. On top of that, customers continue to have the benefit of a free baggage allowance up to 50 kilos,” says Andrew Deyto, SuperFerry AVP for Sales & Marketing. For more information, call (02) 528-7000, Type SFTEXT your message and send to 2327 for Globe and TM subscribers or 0917-890-2327 for Smart, Talk 'N Text and other networks. 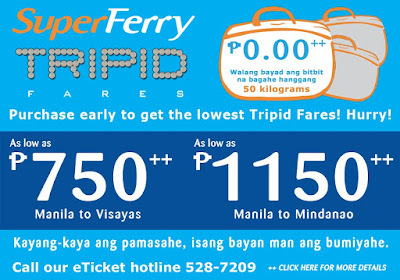 Visit www.superferry.com.ph, or email info@superferry.com.ph. The buying period is up until August 5. The sailing period is from August 18 - September 30. "SuperFerry makes travelling affordable to all Filipinos. After all charges are paid, SuperFerry fares remain substantially lower than other alternatives,” says Andrew Deyto, SuperFerry AVP for Sales & Marketing. "On top of that, customers continue to have the benefit of a free baggage allowance up to 50 kilos," Deyto said. Tickets can be delivered right at your doorstep when you book through SuperFerry hotline, 528-70000. SuperFerry delivery is available in Metro Manila and selected areas in Luzon. SuperFerry is the first carrier to offer ticket delivery and accept ticket payments over the internet using the ATM PIN. For more information, call (02) 528-7000, Type SFTEXTyour message and send to 2327 for Globe and TM subscribers or 0917-890-2327 for Smart, Talk 'N Text and other networks. 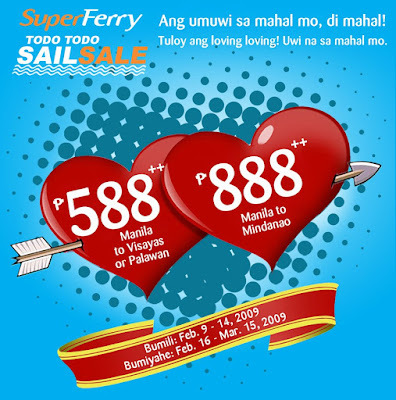 Visit www.superferry.com.ph or email info@superferry.com.ph.